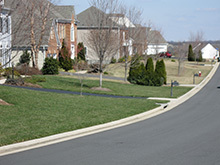 The owners Chuck or Ken at your request will come to your property and provide a free no cost evaluation of your lawn. This evaluation explains in detail what problems you have in establishing and or maintaining your lawn. We will give one or more options to repair or eliminate these problems and what your cost is to do so. Ultra Turf treats for weeds each visit to your property. If weather is to cold, hot or dry, applications are adjusted accordingly. There are many different types of weeds, weed grass and plants such as sedge (yellow and purple nut sedge) which requires special products and attention that Ultra Turf can provide. Heavy infestations take additional treatments and time to control. 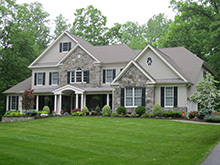 Ultra Turf provides insect management for both lawn and landscape plants. The Virginia transition zone provides more and longer life cycles of turf and plant damaging insects. Insect control is a part of Ultra Turf’s lawn and shrub care programs. Tick control and other means of treatments when needed are available for additional cost. •	Allow air, water, sunlight and the products we apply to get closer to the root zone to improve existing and new grass. •	Improves over seeding results by allowing better soil contact with the seed. 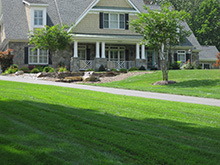 Aeration is a must have service in order to build and maintain a healthy lawn in this area. We feel it is so important we haven’t raised our price for core aeration in 25 years. Power seeding uses a machine dispenser that drops seed in front of spinning blades that scratch the surface of the soil giving more soil contact and a more even germination of seed. This method is good when establishing a new lawn or repairing more difficult areas. Lime, top soil or composted material is delivered and spread to improve difficult areas. This service is limited to areas at a minimum charge of $500. During the month of August, the minimum charge is lowered for existing fertilization customers. Contact Ultra Turf for more details. At Ultra Turf, we use organics in our fertilization whenever possible. If you prefer not to use pesticide or herbicides, we can accommodate your request. Keep in mind the use of some nonorganic materials applied at the correct time and amounts prevents us from having to use more in the future to control unwanted pests. Discuss your options with an Ultra Turf Representative. The owners and staff at Ultra Turf take pride in providing you with results; we continue to stay up to date with current research, product advancement and new equipment. All our applicators are licensed state certified or registered technicians undergoing yearly re-certification programs. Since 1987 we have tried and tested numerous products and methods on lawns just like yours. We know what works.